Evapotranspiration is the movement of water from the Earth's surface to the atmosphere by evaporation and transpiration. Evaporation is the movement of water to the air from the ground or bodies of water (such as lakes). Transpiration is a process that happens in plants, in which water is lost through stomata in the leaves and becomes vapour in the air. Together, these form an important process in the water cycle. 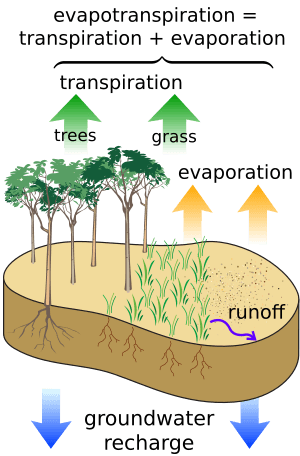 Evapotranspiration Facts for Kids. Kiddle Encyclopedia.